It appears that winter has found its self respect and is intent upon providing the proper upstate snowy experience this season. And good for winter -- we've been thinking lately that it had lost its way. That means we should reacquaint ourselves with the many aspects of the snowy winter. Some are obvious -- yes, it can be pretty, and yep it can make travel a hassle. But other moments of the snowy season are underrated. Here are a bunch of those underrated things that occurred to us on this snowy afternoon. And if you have some in mind, please share. A fresh layer of fluffy snow dampens sound, creating a wonderful quiet. Everything just feels so still. And the sounds that do make it through -- like that train off in the distance -- take on a new presence. There's something comforting about hearing the low, scraping rumble of the snow plow as it passes by a on a snowy night. Respect to plow drivers for being out there. Snowy nights take on an otherworldly look in part because the snow reflects so much more the available light. And a clear night with a bright moon is like walking on a planet with a cold sun. Whether it's human footprints, dog paw prints, bird tracks, or something we can't quite identify, there's just something intriguing about a trail of fresh prints through the snow. Right after the snow first sticks to the road -- and before it turns all gray and slushy -- the tire tracks become oddly mesmerizing repeating patterns through the snow. 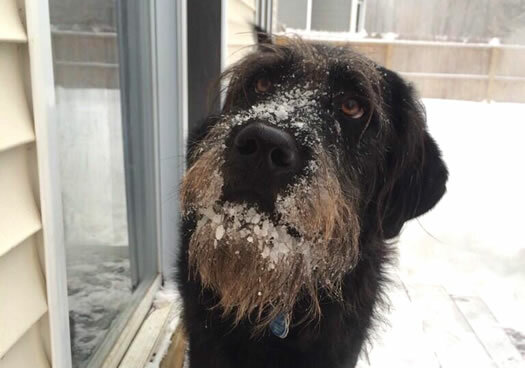 Dogs and snow are a good combination in general. It's made better by the snowy dog face. 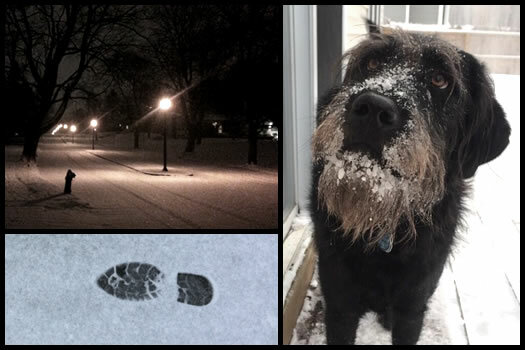 Henry (above) has an especially great snowy dog face. After a big snowfall, everyone's outside shoveling. And while pushing all that snow isn't so much fun, it is good to see the neighbors during the winter -- especially if everyone's pitching in together. Everyone's cuter with a snowflake or two. Whether it's people footprints, dog paw prints, bird tracks, or something we can't quite identify, there's just something intriguing about a trail of fresh prints through the snow. Right after the snow first sticks to the road -- and before it turns all gray and slushy -- the tires create oddly mesmerizing tracks through the snow. Hey, why don't you go/do/come over... It's snowing, we'll just stay home. 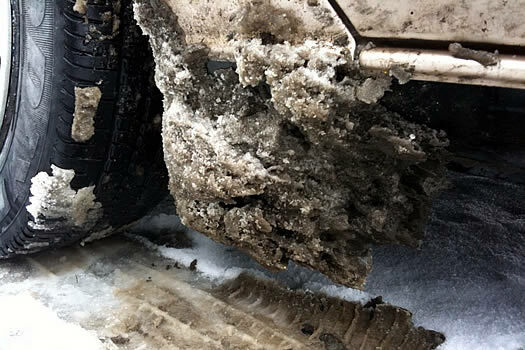 We're still not sure what call that frozen slush that forms behind the tires on cars -- carnacles, fenderbergs, sludgesicles. But we do know this: We love to kick that stuff off the car. Hey, what do you expect? This is the Northeast. There is no bad weather - just inappropriate clothing. Old Man Winter has reared his ugly head. Expect a blast of Arctic air. We're in for some bitter cold. The birds. The almost hysterical twittering, fluttering about of birds, especially if you have bird feeders, is more noticeable against a blanket of snow. And most particularly a vibrant cardinal on a snowy branch. Upon reading the headline my first thought was the quiet. I'm a shoveler, not a snowblower-er (for a number of reasons I won't get into), so I appreciate the times I can beat the snowblowers out in the morning and enjoy the quiet of the snow in all the wonder of its snowitude. The chore of shoveling forces me to experience the stillness and tranquility of a freshly fallen snow and that's a tough winter experience to beat. Shoveling = bad for your back, good for your soul*. Thank you for this post. Snow is indeed inconvenient, but it is hard not to love it. I like to take a walk in my city neighborhood when the snow is falling, especially at night. It is so much more quiet than usual. I also love that newly driven on snow, as it turns a light tan. It reminds me of making pie dough - it looks like flour with the butter cut in. To avoid the worst of it, I try to walk as much I can until driving and on-street parking is tolerable. The crunch - or if it's very cold, the squeak - of snow under boots. A snow storm is also something we can all share. One of the few times that everyone has something in common.